OSDoge Setup with RSSI update! This is an updated setup guide for the OSDoge board. As of 12/1/15 the new OSDoge boards come flashed with the latest version of MWOSD 1.5.1. This version of 1.5 GUI is much faster and easier to use then the 1.2 version that was used in my first OSDoge setup with RSSI guide. The OSD font is bigger and fatter so it’s easier to read when you are flying. You have to use the version MWOSD GUI that’s flashed on your OSDoge. If you are using MWOSD 1.2, you have to use the 1.2 version GUI. Same with 1.5.x. 1.5.x GUI will only read MWOSD 1.5.x. You can’t use 1.2 GUI and connect to an OSDoge that’s running MWOSD 1.5.x. The easiest way to figure out what version is on your OSDoge without using the computer is connect the VTX and Cam. The start up screen on the OSD will say what version it’s running. First, read the OSDoge with RSSI setup guide, but don’t download anything yet. The physical setup is the same except the guide uses the rev5 Naze32. The new rev6 Naze32 is almost the same board except for the rx input headers and the USB doesn’t line up. The rev5 uses a 5 pad double side, the rev6 uses a 10 pin. For the sake of the OSDoge setup, all you’ll be using are the first three pads (rev5) or holes (rev6), GND, 5V and PPM1. This will connect via PPM to your D4R-ii. So nothing really changes here. To use the new OSDoge you’ll need to download MWOSD 1.5.x. If you bought an OSDoge from my store after 12/1 it will be running the latest 1.5.1 firmware. The new ones won’t connect using older versions like MWOSD GUI 1.2. Download MWOSD 1.5.x The newest is 1.5.1 but it doesn’t support mac yet so I’m using 1.5. After you update Java go to this page to verify your Java version. It will ask if you trust this source, click yes, then run. What this does is it gives Java permission to be used on your computer. After you download and install everything, restart your computer. On the OSDoge board, move the switch towards the USB and connect the USB to your computer. Make sure you plug the USB into your computer with the board connected before moving to the next step. On mine if I don’t do this it won’t open my correct CP210 port. Open the folder for your system. I’m using a mac so I’m using the “applications.macosx”. If you are on a windows machine, open the one for your version of windows, 32 or 64 bit. Click the “MW_OSD_GUI” icon to open the program. On step 9, if you get an error saying the the file is damaged and it should be deleted, it’s just a firewall error. 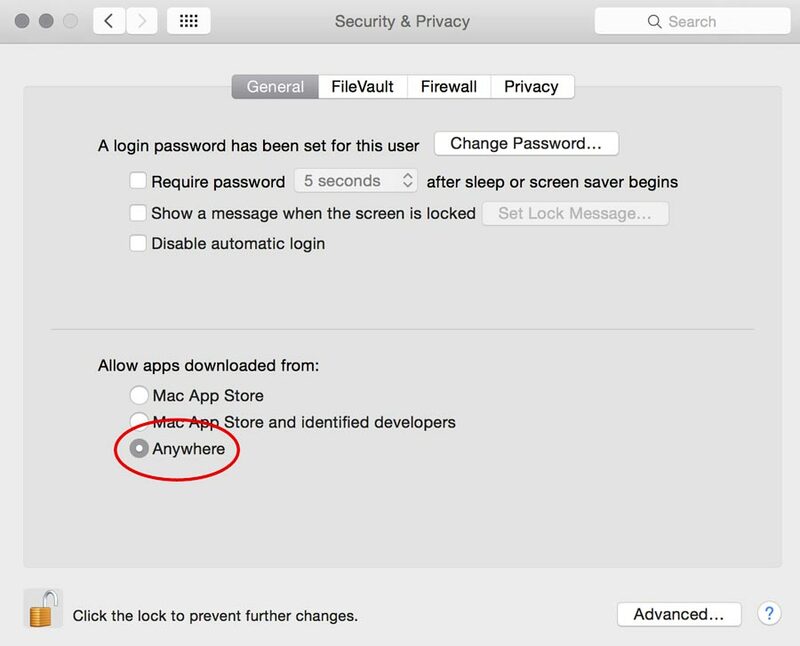 On a mac go to system preferences > security & privacy > general tab > and under “Allow apps downloaded from:” click “Anywhere”. You’ll only have to do this the first time you open the GUI. After it opens you can set it back to whatever you want. Once you have it opened and connected, make all your settings and hit “WRITE ” under OSD CONTROLS on the left before you disconnect (close comm). All the small green boxes are what I have enabled. The only ones you must have set like the image above are RSSI and Main Voltage. This screenshot is set for 3s. If you are running 4s, change the battery cells to 4 and your voltage alarm to 13.6v or whatever you want the voltage to start flashing. All the other green boxes are just whatever you prefer. Play with it and see what you like. Hope that helps clear up the confusion. Thanks for sitting through this boring post. In my next build, the QAV210, I’ll show you a dummy proof way to set this up. 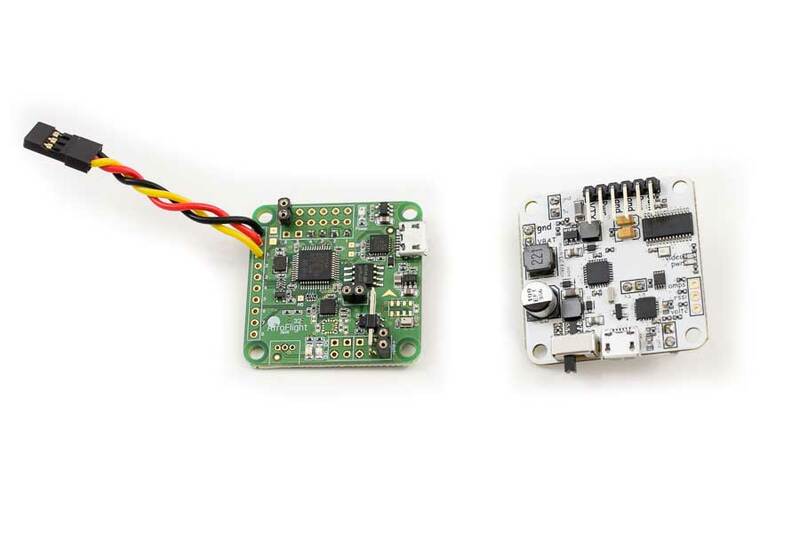 If you don’t want to mess with any of this, you can buy a custom OSDoge/Naze32 stack fully configured with Betaflight, setup with RSSI and all the other OSD goodies. Thats great thanks. Just got mine through post. On the Naze32 rev6; are you running BetaFlight ? as of a couple of weeks ago, yes. This is cool. I have your stack with the rev 5 board and 1.2 on the doge. Any advice on how to upgrade the doge to 1.5? in order to get the fatter text you have to get a new OSDoge ? or is there an update? no, you can flash the OSDoge to the newer firmware. After re-reading I think I would need an updated Naze32..is this correct? no, you can use any version naze32. It might be beneficial for some users having a video/article showing how to update your board to 1.5 using the Arduino software. I was able to do it two nights ago after lots of googling around. Having a connection issue. Done everything above just as you have it. v1.5 for Mac, Java 8 Update 66. Installed driver. I see the correct port in the MW interface…hit it and it keeps blinking “waiting OSD”. I also have the switch set towards the USB port. Any ideas to try next? I can connect to my NAZE just fine using the same driver. is your OSDoge board on 1.2 or 1.5? If you are still on 1.2 it won’t connect with v1.5. I’m afraid you’ll have to tell me Mike. You set the stack up for me. Figured it out. I failed to read the fine print up there with 1.5 not working with 1.2. lol Sorry about that…but FYI…you can’t update firmware to 1.5 if using Java 8 (at least in the OSX platform). Have to use 6. But oddly enough, you need Java 8 to update the GUI. Wild. Who knew? it’s what worked for me. My OSD is 1.2 which is what it was shipped with. The download from MW OSD 1.2 from the original posting on this topic is damaged and will not open on my Mac. All of the other versions of the MW OSD will not connect because the versions are different. Any ideas how I can work around this problem and get the updated firmware? I actually have never gotten my MW OSD 1.2 to connect to the computer. I made all the changes in my headset. What is the best way to connect the OSD to the Naze32 Version 6 with the Rx header no longer lining up properly? I’m not getting the “SLAB_U-BTOUART” on the left? What is the current output for the 5V regulated? I ask because I’d like to put some lights on. I cant seem to find documentation. it’s somewhere around 300mah. I would not power LED lights off the OSDoge. That will kill it. Awesome. Pololu it is then. Everything works fine, until I arm the quad. Then the osd freezes. It says no data and also says disarmed. Also when I used regulated power on 3s the osd display would turn on and off. It still does it but only on a punch out. The osd display looks fine on 4s. But freezes when armed.any ideas? that’s strange. It’s hard to troubleshoot from just the info provided here. are you sure there’s not a loose connection somewhere? I can shake the quad and move the wires around and I don’t have any problems. But when I arm the quad the osd freezes. The only thing I have done different from your video is I have enabled the gimbal. I am using a micro servo with a micro cam on it for tilt only. It is wired to #1 servo lead on the naze. How are you flying the quad with a servo lead attached to channel 1 on the naze? where are your ESCs connected on the Naze? how are your esc signals connected to the naze? Hooked up to 3-6 on the naze 1 and2 are servo tilt and pan. I am only using 1 for tilt. I picked up a CUSTOM OSDOGE WITH NAZE32 STACK from the site and connected the Naze32 with my Mac with no issues. Updated and configured with Clmeanflight. I’m trying to connect to the OSDoge with MW OSD and can’t. I tried version 1.5 and 1.2. Version 1.2 seems to connect because the Rx and Tx are flashing but the screen simulator still reads disconnected. I tried connected to Arduino to flash and can’t. From the video’s I’ve seen online the “port” should read: /dev/tty.SLAB_USBtoUART instead I only see /dev/cu.SLAB.USBtoUART. Anything I missed. Tried with windows as well with no success. Similar issues with 1.2.
all the OSDoge boards I have now are running 1.5 so you need to use the 1.5. Did you download, install and grant permission for JAVA? I’m using Naze32 and OSdoge with 1.5. All connected, I have osd on goggles but no video out from camera (sony 600tvl). Double checked camera connections and they are good (they are wired up to the OSDoge same way as in your video, with solder jumper set to 12V-metered wires and I’m getting voltage at connection outputs).. Is there something I’m missing here? Or is the camera defective? what video transmitter and RX are you using in the goggles? what version is the camera, NTSC or PAL? I made two dumb mistakes that caused the same thing that I will just throw out there. Did you check the camera lens cap and check the VX/ TX settings and channel? Fatshark comes defaulted to Raceband and the TX is defaulted to Immersion band. Also don’t forget to test all 7 channels on the band. I did get MWOSD 1.5 GUI working on Windows 10 using Java SE6. I updated the SILABs driver port settings to 57600 on COM5 and match in MWOSD. The GUI still says “Waiting for OSD”. I also ensured the switch it towards the USB port. Anything I might be missing? I’m using a Immersion 600 with a 5.8 RC832 on the goggles. Camera is a NTSC. I also checked the settings of the OSD to make sure it NTSC was checked. did you set the vtx to the correct band? On mine I have to move the dip switch up, up, up, down for my video to work. Yeah, I double checked the channel. Even tried switching the dip switches around to see if another channel would work. It’s looking like my camera is bad. It appears the Immersion vtx is working since I’m getting the display from the OSD. Dave, I had the same problem and what got it to connect for me was to plug my battery in to my quad (props off). Thanks for the advice. I gave it a try tonight and didn’t have any luck. I can see the USB connection in MWOSD but still reads “Waiting for OSD”. I can’t think of any other potential causes. I checked my OSD board and the resistor is missing. Is there anyway to fix that? I used a socket on a driver to install the board and it’s possible I might of hit the resistor with the socket. Yeah, that was the problem with mine though i am convinced it came that way. You have to look very closely as the resistor is super tiny. Mine is completely missing on the brand new board that arrived hours ago. Is there a chance that some of these are coming defective from the supplier? Is there a way to fix this? Either by using a breadboard resistor (would need to know the resistance of it) or by just soldering the connections together? Installed this on Rev6 just as your video shows. I have perfectly clear video but NO osd overlay display whatsoever! Please help! Well the Naze does not control the OSD, the OSDoge does. Are you sure you have configured your OSD with MW_OSD_GUI? Any posts regarding the stacking of the OSDoge with the Version 6 Naze32? PLEASE someone tell me how to change the default 20deg pitch…i want at least 45degs. all i want is pitch degrees to be increased..thats it..no upgrades, no things, i just want to fly with a usable degree in pitch..please. Do I need to connect both the GRD/BAT next to the USB port and the GRD/VBAT ? Both to the PDB or VBAT on the Naze to VBAT on theOSDOGE and the other next to the USB port direct to PDB? The VBAT/GND goes to the PDB or battery. The GND/BAT goes to the naze32. Posting here as a courtesy. I had the large OSdoge capacitor come off. Here is the response I got from DTF UHF. I was worried about smoking a board if I ran without it, so I have been grounded for the past few days. Looks like I could have still flown, and finding the capacitor part number without his help was pretty much impossible. Hi Mike- Any insight into how to upgrade the OSD Board to 1.6? Looks 1.6 like it better supports the latest betaflight version. Thanks! For those that blew up the capacitor on the OSDoge board, there is a company in TX that can fix them for a lot less than having to buy a new OSDoge. I don’t work with this company, I am just a satisfied customer. Contact Ken Stovall at http://www.txsat.net. He will take care of your OSDoge. I’m getting quite a bit of video interference in the form of lines on the screen. I’m thinking of flying with 2 batteries to combat this. If I just keep the PDB powered with the current 3s 1300 battery that now powers everything, what 3s battery do you think I should select to power the Naze, OSDoge, and the camera? I would just connect thru the VBAT, right? I am getting a error saying i need to update my gui or my osd board. and i have no idea what verison or what i need to do. is there any help you can give me. the easiest way to see what version the board is running is hook up the camera and vtx. When you plug in the battery, the OSD will tell you what version it’s running. Osdoge is staked atop a naze 32. I have video output to Tx. I can receive the video. I have no On Screen Display. USB from board to port on computer is problematic. MSOSD gui will not see a com port. Arduino displays this…. Board at COM3 is not available. Fried? There is a blue light. Yea!